Converting to a Roth IRA is appealing if you think Federal taxes will go up, but now carries a new risk. Roth conversion is still a good idea but it's important to understand how the rules changed and could come into play. Phantom Income. The new risk to converting stems from a change in tax rules and it's probably not going to make you decide against converting a traditional IRA to a Roth, but it is a material new factor in the equation, a risk of being taxed on "phantom income." Roth v. Traditional IRA. Roth conversions are likely to grow more popular because a Roth is taxed differently from a traditional IRA. You contribute pre-tax dollars to a traditional IRA, which lowers your taxable income each year you contribute. In retirement, you pay taxes on withdrawals to live on. In contrast, a Roth IRA allows you to contribute after-tax dollars and grows tax-free. Withdrawals in retirement are also tax-free. That's why converting to a Roth now looks smart if you think tax rates will be higher in your retirement years. Tax Rates. The national debt and associated interest expenses are expected by the government to rise sharply due to years of Federal deficit spending, along with rising costs of funding Social Security and Medicare benefits. As a result, tax rates could rise in the decade ahead, which would make withdrawing money from your traditional IRA cost you more in taxes annually in your retirement years. New v. Old Rules. 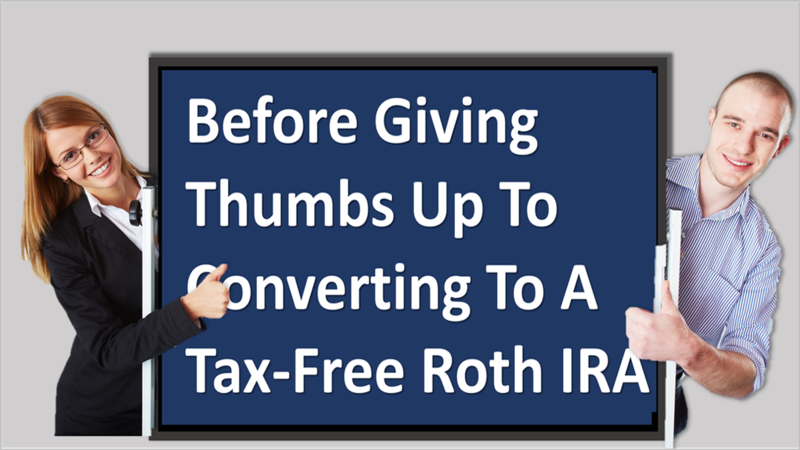 Until now you could convert to a Roth IRA and then push the "undo" button and reverse the conversion in case of a sharp decline in your account value. The undo tactic has been around for years and it is important to understand what elimination of this technique means. Before 2018, you could reverse the Roth conversion that same year and suffer no ill effects, by using a tactic called a "re-characterization." The Tax Cuts and Jobs Act (TCJA) eliminated using this maneuver. Re-characterizing Example. Before tax reform, say you converted $300,000 from a traditional IRA to a Roth in June. If you were in the 24% Federal tax bracket, you would have owed $72,000 in April of the next year. In November, if the stock market had plunged by 37%, as it did in 2008, your Roth IRA is now worth $189,000. Making matters worse, you'd still have owed $72,000 to Uncle Sam on the withdrawal of the full amount converted from your traditional IRA. You'd have to pay tax on income that was lost in the market decline. The tax reform eliminated the option of undoing the conversion to avoid paying tax on phantom income. The New Risk In Converting. Since the new tax law eliminated this option, you now have little choice but to pay Uncle Sam the phantom income-tax and — should your account value plunge after converting — you must be prepared to stick with your long-term strategy in the hope that the stock market will rebound. Past performance is no guarantee of your future results, but a recovery is exactly what happened after the 2008 bear market. The climb back may take years and it's possible — though unlikely — that it might never rebound. From its October 9, 2007 record high of 1565.15, the S&P 500 dropped to a low of 676.53 on March 9, 2009 in the near-collapse of the world financial system. It was not until March 28, 2013 that the S&P 500 surpassed its previous record closing high set in 2007 — a seven-year span. Bottom line. The new risk of converting and getting hit by phantom income tax is now part of the equation in the math of retirement planning. However, if your Roth IRA will be compounded tax-free for the next decade and you can tap it for income without paying Uncle Sam a dime, then the math may indeed work better for you — especially if you believe tax rates are on the rise. This article was written by a professional financial journalist for arista investment and is not intended as legal or investment advice. Copyright © 2016 Arista Advisory Group, LLC. All Rights Reserved. Copyright © 2019 Arista Advisory Group, LLC. All Rights Reserved.